Please move this to a projects category if/when it gets created. 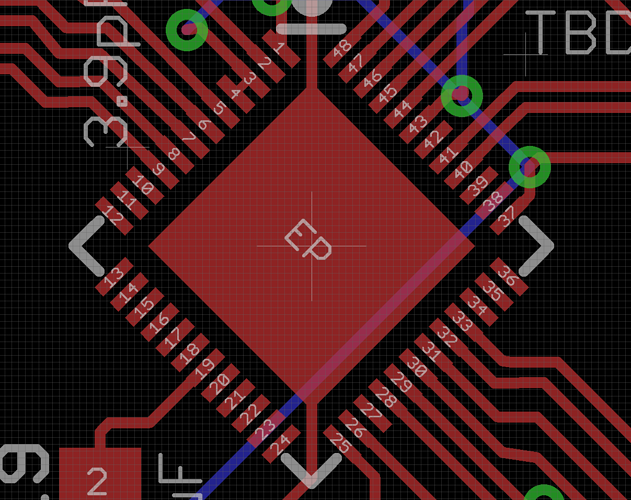 So I should really be starting off with simpler projects but the timely delivery of some esp32 chips has me wanting to know sooner rather then later if we can nudge the V-One to print fine pitch below the recommended specs - see this thread ( fine-pitch). So it's still an early work in progress and while I am not counting on this being successful (as I have esp3212's on order and will most likely be designing my initial projects with it or the wroom32) I am using this project as my initial goto test for fine pitch testing. I also plan to test .5mm and others yet TBD. 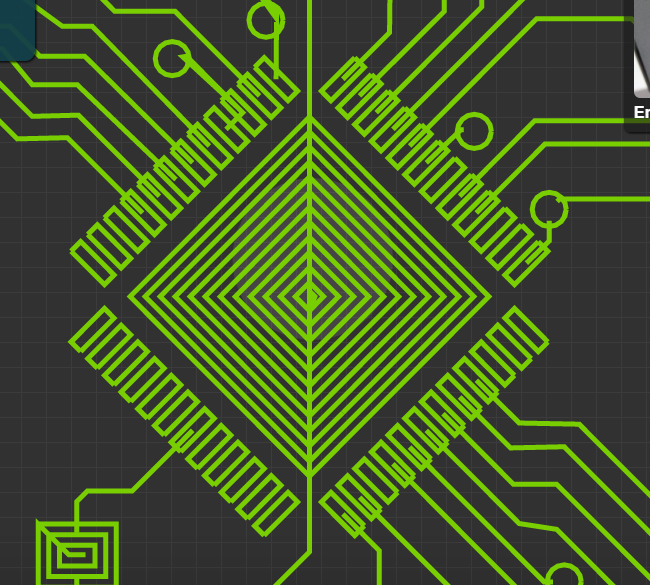 So pass one, keep in mind i have initially disconnected most i/o for the moment, i still have 10 or so vias which i woudl like to reduce if possible (also they are way too small) and component placement has not been compared or matched to the wroom32 hardware design example. @jazozaya I am surprised that the pads on this design did not qualify for automatic pad reduction? @jazozaya Before I update my design with trace based vs pad based footprints are you any closer to getting standard footprints libs rendering single traces? Sorry - This week I have been helping the production team with automating some test and calibration procedures. I didn't get a chance to do any work on fine pitch stuff this week ... If I am able to work on it next week, the software wouldn't be released until the week after that, so maybe updating your design will be faster. I'll be sure to post my progress and keep you in the loop. Can you confirm this is still present in v0.7.0? 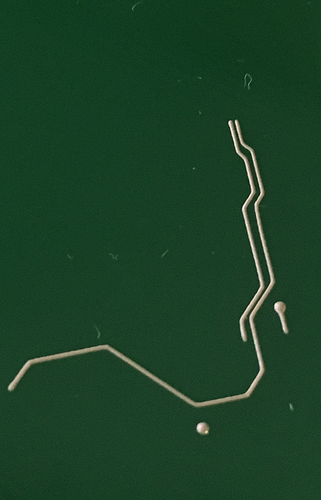 I tried 0.23 mm x 0.8 mm and they are indeed collapsing into a single line. Mine still looks like the one photo i posted above. Definite boxes. @jazozaya Did you figure out why that footprint is not coming up a one line vs a box? Not yet - but I have a hunch. I'm almost certain it's because the pad is rotated at 45 degrees, which is causing Eagle to export the pad wonky. I'm going to confirm it right now. What's the status of this project? 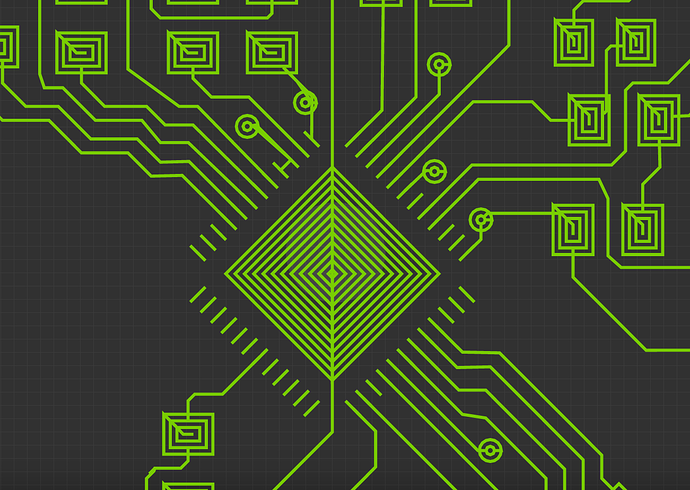 We're interested in using ES32 ICs for workshop projects, to teach advanced design. I never understood what the problem would be in using the ESP32 modules, but I guess the pads are too close together for either the ink or paste printing? When I look at pictures it doesn't seem to be that the pads are so close together, so is it just perspective? Hi Michael, Before Wroom-32 modules were readily available all I could order was the bare chips. I figured it would also make for a nice test of the V-One. At the time I was experimenting there were a few issues with converting the gerbers with really fine pitched devices so while waiting for a fix I got side tracked on other projects. I'd rather use bare chips anyway to avoid a PCB on PCB sandwich. ESP32 information is kind of hit and miss, and I don't see the model number for modern ESP32 chips with no PCB material. Do you know how to find this? How can a Voltera user know before ordering a part if it's footprint is too fine for the Voltera One? When the Voltera One can't produce fine enough printing, are traces or solder pads the bottleneck? I assume solderpads are. The TLK110 you mention has a 48LQFP package format, right? Will the Voltera One work with that? If you contact the sales dept @ espressif they will sell you bare chips (ESP32-D0WDQ6) directly. I bought 5 back in September. I think things are still experimental as far as pitches or traces below the published specs go. I haven't been experimenting with this for a few months ( was also waiting on drill bits) but I plan to get back into it soon so I will post my results back here. Hopefully Jesus or Matt may have some updated info on this topic. Our official spec is here, but fine pitch printing is still experimental and your mileage may vary. If you scroll all the way down in the link Glenn posted, @mewertow just gave an update on pitch resolution. There is no software limitation that will prevent you from loading a file that has 0.5 mm pitch or lower, it will come down to how well the ink flow is calibrated and the height that you are printing at as well as the nozzle diameter. The new solder wire alloy should also make hand soldering way easier. Regarding obtaining ESP32 products, it's been a little easier lately to buy parts. I had overlooked esp32.net as Glenn suggested, since there is a esp32.com site which doesn't provide useful information. 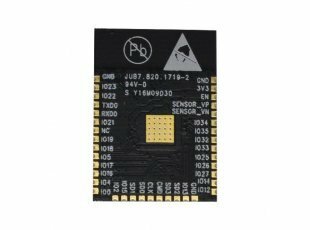 The best link to understand what parts relate to ESP32 architecture is ESP32 Chips and Boards. There are also fresh documents to help create PCBs for these chips and boards on their forum page.